Here, we present validation tests of the fluid dynamic solver presented in von Boetticher et al. (2016), simulating both laboratory-scale and large-scale debris-flow experiments. The new solver combines a Coulomb viscoplastic rheological model with a Herschel-Bulkley model based on material properties and rheological characteristics of the analyzed debris flow. For the selected experiments in this study, all necessary material properties were known - the content of sand, clay (including its mineral composition) and gravel as well as the water content and the angle of repose of the gravel. Given these properties, two model parameters are sufficient for calibration, and a range of experiments with different material compositions can be reproduced by the model without recalibration. One calibration parameter, the Herschel-Bulkley exponent, was kept constant for all simulations. The model validation focuses on different case studies illustrating the sensitivity of debris flows to water and clay content, channel curvature, channel roughness and the angle of repose. We characterize the accuracy of the model using experimental observations of flow head positions, front velocities, run-out patterns and basal pressures. 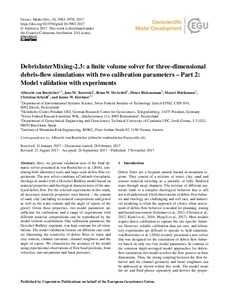 von Boetticher, A., Turowski, J., McArdell, B.W., Rickenmann, D., Hurlimann, M., Scheidl, C., Kirchner, J. DebrisInterMixing-2.3: a finite volume solver for three-dimensional debris-flow simulations with two calibration parameters. Part 2: Model validation with experiments. "Geoscientific model development", Novembre 2017, vol. 10, núm. 11, p. 3963-3978.